What does your lobby say about your company? Your lobby is the first place most visitors encounter. Creating the right first impression can set the tone for their experience. 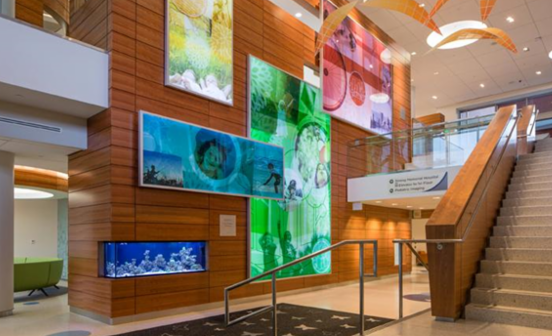 Art plays a pivotal role in how people respond when they enter your lobby. Architectural design creates a general feel for the space. The design itself has its own aesthetic quality. The artwork should compliment that feeling and engage other senses. This brings about a more positive experience. Art is also used to brighten up a space and make it feel less institutional. The effect you create with art will be unique to your facility. Most healthcare environments strive for spaces that are comforting. Spaces that provide a sense of familiarity and that are inviting. Art and architecture should align. Colors, textures or themes that clash or lack of harmony will resonate at some level. Adding to whatever feeling of stress your guest may be experiencing. Lobbies offer the opportunity to go big. Art should be proportional to the size of the space and be large enough to create an impact. seems less overwhelming and more intimate. What new art project can I help you with? Call or email me today.